As a kid, I have very few memories more vivid than of spending a week in Vacation Bible School. I would attend two weeks: one at my church and one at my best friend’s church. I remember the week at my friend’s church the most because it was different. As a part of their VBS, we would go on a field trip one of the days. I’m not sure what the field trip had to do with Jesus, but we got to go to the Mrs. Baird’s factory in Dallas where they make baked goods. Everyone got a free pack of gem donuts on the way out. Mostly I remember the donuts. But the VBS was memorable, and as a kid, I wanted to go back there each year—even though I didn’t go to church there regularly. The truth is that VBS continues to be an incredibly effective way to reach neighborhoods of kids in the 21st century. Long after churches started packing up the hymnals, hanging projectors, sending email blasts, and allowing coffee in the sanctuary, the classic VBS hangs around. This is a testament to the idea that externally-focused, community-centered ministry never goes out of style. In fact, I would argue that VBS is the one week a year that churches who are otherwise insular open their doors to outsiders and share the gospel. I don’t mean this disparagingly. I mean it as a glimmer of hope. If we can begin to rethink VBS not just as an event but as a gateway to year-round effective community outreach, there’s hope for every church to experience a breakthrough. 1) Focus on sports or arts training. Rather than the typical worship service, activities, snack, closing session format, consider putting together a five-day sports or arts camp. Bring in high school and college students who love Jesus and who have experience in soccer or baseball or painting or guitar to allow kids to grow in a skill they have interest in. Weave the gospel message into the curriculum. At the end of the week, invite families to come and have kids show off their talents. In this closing session, present the gospel to whole families. 2) Create affinity tracks versus age groups. Even within a more traditional VBS structure, you can win more engagement from kids by focusing on affinity rather age. Many kids get bored in VBS because they don’t like the games but they like the crafts, or they enjoy the games and despise the crafts. Create affinity groups in two main categories: younger elementary and older elementary, but allow kids to spend the entire two or three hours of activities doing things they enjoy instead of things they may or may not care about. 3) Partner with other churches. I know this is controversial. But if you open up the local newspaper in my town in June, there’s an entire section dedicated to churches running a VBS. Literally hundreds of churches are hosting their VBS on the same weeks—some with the exact same theme at the exact same time. Imagine if a few of those churches chose to work together, pooling their resources, and amplifying the impact they could have. Certainly the details can be difficult. Where should it be hosted? How do contacts get split up? Who pays what? All of these are relative minor details compared to the potential impact. The Church can do more together than it can apart. 4) Partner with community organizations. The vast majority of hands-on work with kids in the summer time is not done by churches. It’s done by other community organizations like the YMCA and the Boys and Girls Club. Consider partnering with them to run your week of VBS. They YMCA, in particular, may be open to a week of activities run by a church with faith-based principles incorporated. Though you may be surprised at the openness of other organizations. They are spread thin and are often extremely eager for other groups to help them fill the hours and hours of programming necessary for the summer time. Most churches conclude VBS with a cursory, “So, if you ever want to join us on a Sunday…” And then kids don’t. Mainly because they can’t drive. Even if they wanted to come, if there’s no compelling reason for a parent to drive them back on a Sunday, they won’t. Find a way to incentivize a follow-up visit. Host a donut party, have the kids involved in the Sunday service, send a redeemable “coupon” for a coveted freebie. Think of some reason why a kid would beg their parent to bring them back to church on Sunday. 6) Host your event off-site. There are kids who will never, ever come to the VBS at your church because it’s at a church. Think about what kind of influence and impact you might be able to have if you hosted your event in a non-church location like a park or community center. Perhaps this would cause you to think differently about your potential audience, and the very act of moving your VBS off-site would trigger a ripple-effective of externally-focused thinking. Find ways to create a “win.” Everyone enjoys winning: winning a prize, winning a contest. Kids love winning, too. Find ways to incorporate healthy competition into VBS from Bible memorization, friend inviting, or days attending. Celebrate lots of winners throughout the week, increasing the odds for more kids to win. This can boost your engagement and sustain enthusiasm through the lull that is common in the middle days of a VBS. 8) Bring in outside talent. Consider bringing in an outside talent as a draw. I’m not talking about spending thousands of dollars on a big name (more power to you if you can). But find a friend of a friend who is a great musician, a balloon artist, or a kid-friendly speaker. Use this outside talent as a marketing tool for the final day. Promote it and invite everyone to enjoy this outside talent. 9) Theme the whole month. Don’t limit the VBS theme to a one-week event. Create continuity by initiating the VBS theme two weeks before and one week after. This creates a space where kids are excited about the topic, inviting their friends to the event, and is a natural segue for newcomers. The most important thing you can do in a VBS is focus on the families of kids. Even as you preach the gospel to kids, churches must find ways to loop-in parents. Kids who accept Jesus will be spiritually orphaned in irreligious homes if we cannot find ways to get parents involved in the follow-up. Everything you do from marketing to the VBS to the closing program should be zeroed-in on bringing parents into the fold. If you were hoping for a post on how to create backdrops that are cute or craft ideas that are fun, may I’m sorry. I would point you to Pinterest. There’s a lot of helpful things there. 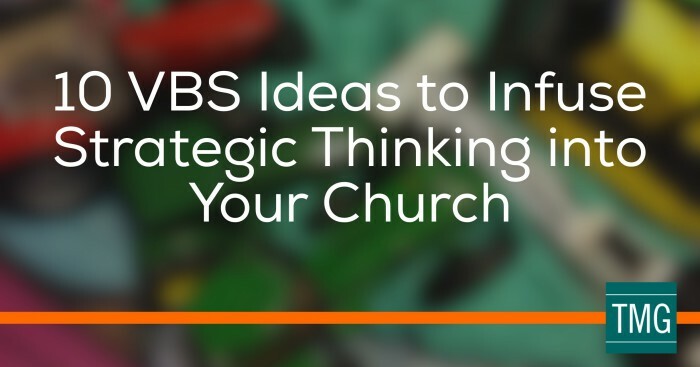 But if you were looking for a post about how churches can apply higher-level, strategic thinking to VBS, then I hope this post was helpful to you. It’s time for churches to begin seeing VBS not as an event, but as a launching pad for community outreach. This summer, how can your church use VBS to strategically impact your community with the gospel?